A man has taken to social media to rejoice after learning that his doctor friend miraculously cheated death after being involved in the accident which saw two dead in Lagos. 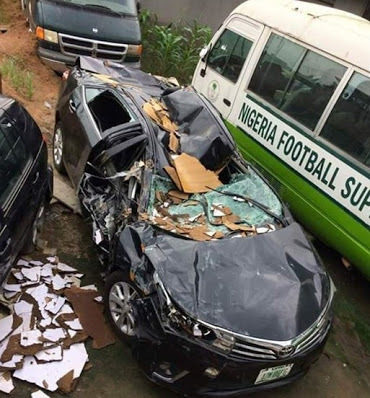 Prof. Olufemi Adetola Fasanmade who miraculously survived this terrible accident. An articulated vehicle fell on top of his car, crushing it and not him. He and his driver came out of this mangled car with minor injuries. Praise God. Prof. Fasanmade, an endocramist and an amiable human being, treats my mother and my family. I recall each time I go visiting him, we discuss the challenges confronting our beleaguered nation. He's so passionate about this country and will always tell me how he looked forward to the day our country will come out of the woods. Unlike many doctors who see themselves as next to God, Prof. Fasanmade is approachable and is also ready to help at the shortest notice. He can diagnose and prescribe medicine for you in an emergency without asking for deposit. On many occasions and in crisis situations, he has had to come to my mother's aid even without seeing her. Once she's stabilised, he'd would ask that I being her to him to see and follow up. You can imagine my excitement when I learnt he was the one in this car which was crushed by care less articulated vehicle driver. I am so overjoyed that I'm sharing this post in celebration of a miraculous survival of my dear friend. I am so happy that he's alive and well and will continue to provide healthcare to the people who rely on him in a country where healthcare provision is a tall dream. Please join me in thanking God for their survival. May God's name be praised. Amen".